Naturally, children are born as friendly beings – they are friendly towards their caregivers and they are friendly to their surroundings. And thus, quite subtly, they sometimes become ‘too friendly’ with the worms also which find a comfortable home inside their bodies. This condition is called a worm infestation and it has severe health repercussions. 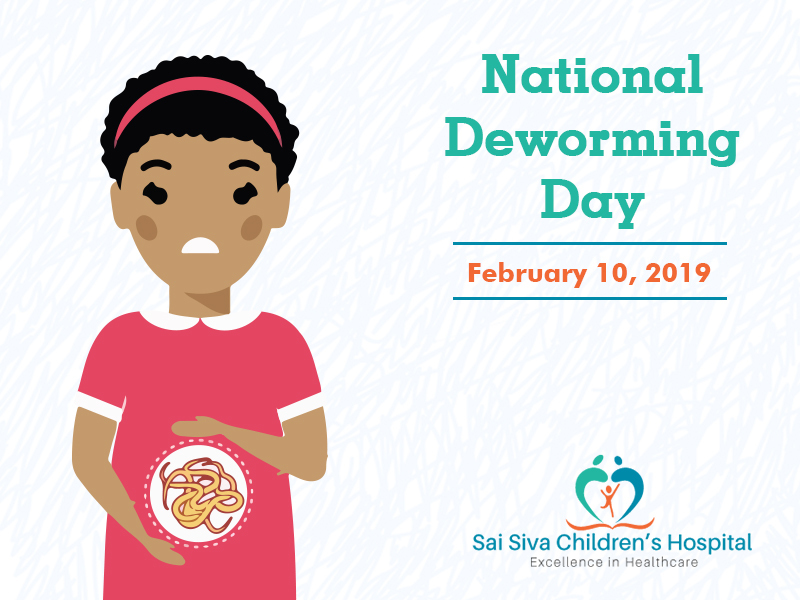 To create awareness of this health hazard, we are observing 10th February 2019 as the National Deworming Day. This blog will give you a clear picture of the importance of deworming children. Children sometimes get infested by various types of parasitic worms like tinea, tapeworm (mammalian meat), roundworm, threadworm, etc. The way in which children are treated so that the worms would leave their system is called deworming. At highly infested areas, such deworming campaigns are often conducted by the government and NGOs. How Do Children Get Infested? Worms come in proximity to children through contaminated food. It is more likely to infest a child who lives in a place where proper sanitation is not available. Many parts of India where the tradition of defecating in public is still practised, such infestations can become epidemic. Adults can get infected too. But children are exposed to more dirt since they play and crawl on the ground. So, worm infestation is seen more in children. In poorer countries worm infestation contributes a major chunk in infant mortality rate. Worm infestation can lead to many different kinds of health condition. And if left untreated, they can even become fatal or disabling. Infestation spreading to other places like the brain or the spinal cord. Treatment becomes more difficult at later stages. Better, take your children to visit a paediatrician on a regular basis. Can You Prevent Worm Infestation? Fortunately with hygienic practices can prevent worm infestation. But in areas where the degree of infestation is high, you will need to be very very careful regarding the hygienic practices of your friends and family. Keep yourselves and the house clean. Use sterilized utensils for infants. Wash fruits and vegetables before eating those. Do not eat undercooked food. Keep your food items covered. Boil water and cool it down for your children to drink. If your child is prone to infestation, avoid vegetables that grow near the ground. Always wipe and clean your child properly after changing his diaper. Mammalian meat like pork, beef, etc. should only be consumed after they have been properly boiled. If your family has pets or domestic animals, make sure that their excreta is cleanly dealt with. In addition, just like you vaccinate your child to protect him from infections, you can take your child to our clinic to get a dose of medicine that will prevent worm infestation in him. Worms cannot be transferred through human contact. That means that if a healthy person lives closely with an infected human being, that will not make the healthy person sick. Deworming is mostly done through a routine of medicine. The type of medicine and the course of treatment depends on the type of worm infesting your child and the severity of infestation. These medicinal drugs are entirely safe for children and will have no side-effects. However, do not attempt to self-treat your child or give him any adult medication. An incorrect dose may make the situation even worse; it may even threaten the child’s life. If you feel that your child is unwell, always bring your child to a doctor. In the most severe cases, if the infestation has become life-threatening, surgery can be performed on an emergency basis. But don’t let it reach that stage. Give your child care and treat his health conditions under the guidance of an expert only! If you have any queries regarding deworming of your children or if you suspect that your child might be infested, book an appointment here to seek guidance from our paediatrician at Sai Siva Hospital.